According to the internet -- which would never lie to you -- Americans consume approximately 45 billion sandwiches each year. And according to Yelp, 5,000+ places serve sandwiches in the greater Seattle area. In an effort to find the best ones, we wanted to narrow it down a bit by picking out the top 13 in The Town. How many have you tried? 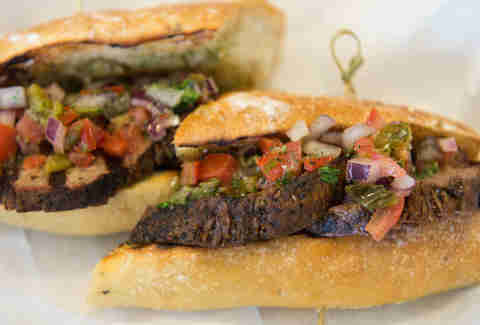 This international street food joint quickly became a favorite for rare meals of all kinds, but especially for sandwiches. 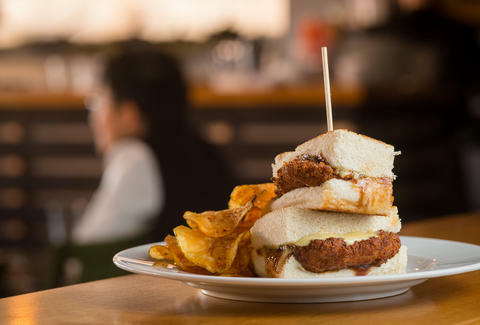 This is all thanks in part to this deceptively simple katsu sandwich, made with a panko breaded pork loin on crustless white bread with Kewpie mayo (sweeter than the usual stuff) and Tonkatsu sauce (basically a BBQ sauce) that absolutely defies a simple description. As much as we love the Mexico City-style sandwiches at Tortas Condesa -- the walk-up window is a must after a late night on Capitol Hill -- or the fried flank steak torta at Fonda La Catrina in Georgetown, this particular classic gets our pick for Seattle's best torta, in part for the simple satisfaction that comes with pulling into the parking lot at one of their three food trucks and finding your hands filled with a pile of carnitas (or one of 10 other meats) lettuce, mayonnaise, avocado, tomato, jalapeño, and pico de gallo, all on soft fresh bread. It is rich, yet delicate. It is served on wonderfully soft bread and with handcut fries. It is a classic but is actually pretty hard to find in Seattle and is almost rebellious in its use of a shellfish that isn't crab… and isn't local. 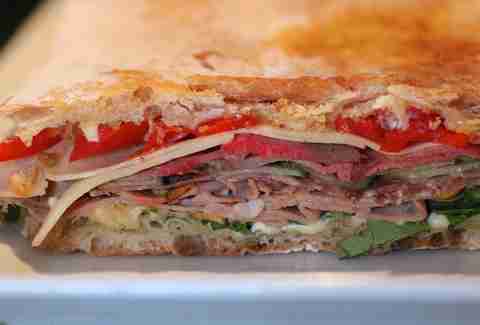 It is without doubt one of Seattle's best sandwiches. What it isn't is cheap. This roll sells at "Market Price" so be prepared to shell out 40-50 bucks. Or more. Luckily, one of the people behind this canal-adjacent alehouse used to own Martino's Smoked Meats (RIP), which means he was able to put this seriously good sandwich on the menu, giving us all a chance to enjoy grass-fed tri-tip sirloin, red oak smoke, roasted poblano, tomato salsa, and chimichurri on a Macrina roll, all of which combine to make a sandwich so amazing you'll think it was an early present from the other Santa. This retail arm of what might be Seattle's swankiest steakhouse specializes in Wagyu beef. From 11:30am to 3pm this seatless spot serves a small selection of sandwiches including a brisket roll with slaw and BBQ sauce that's not to be missed. 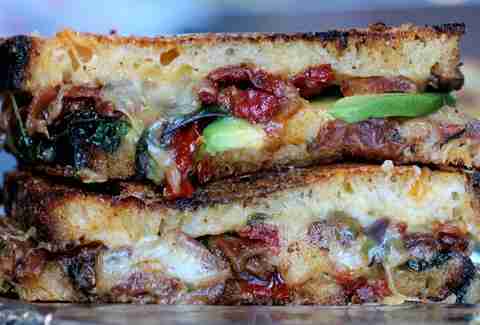 This wildly ambitious grilled cheese is topped with aged chipotle cheddar, house-smoked bacon, caramelized onion, sun dried tomatoes, and avocados. It’s so good you should have tried it years ago... or at least as soon as they opened in 2012. Lucky for you, you can still get it if you go right this minute… or in the next few days or months. Whenever you have the time, really. As much as we love The Peacemaker that came from Roux/Where Ya At Matt, you'll find our favorite fried oyster po' boy at Taylor's Pioneer Square outpost, where they brine (and then inject) their oysters right before lightly frying them, so they come out plump and tasting like the sea. Then, they put 'em on a baguette with the usual fixings (tomato, pickle, lettuce) and a side of fries. What started as an ironically named food truck called Now Make Me A Sandwich has recently added a permanent location on Greenwood. 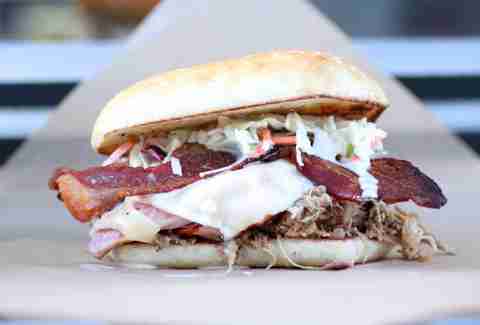 It’s here you can get find the same gravy-topped items they serve from their food truck, including The Bad Lieutenant, which comes with pulled pork, chipotle BBQ sauce, and apple jalapeño slaw... plus bacon, ham & provolone, but thankfully, unlike the sequel, no Nicolas Cage. After the demise of Pinky's Kitchen, the ever-expanding Skillet empire has taken over Seattle's top spot when it comes to fried chicken sandwiches: Skillet’s boasts a savory fennel seed crust, pickled and charred jalapeño aioli, and kale on a potato roll. And you don't even have to stand on the side of 45th Street to get one. Yes, this is the same sandwich -- arguably Seattle's favorite thanks to caramelized onions, slow-roasted pork, aioli, cilantro, and romaine lettuce on Macrina bread -- that they used to make (and kind of still do) at Paseo. And yes, one of UB's locations is the same seaside shack where Paseo got its start... but this isn't some copycat operation. It's run by two of Paseo's former owner's sons using family recipes. And say what you want about that guy: he could make one damn fine sandwich. One of Seattle's most important restaurants, the retirement project of Armandino Batali (Mario’s dad) is best known for its cured meat, but smart diners take that to-go and order the beastly porchetta -- with huge chunks of rich, juicy pork bathed in a garlic sauce -- for lunch. It IS one of the 33 you have to do in Seattle before you die, after all. Rain Shadow Meats Squared, which is a wholly inaccurate description since it's more like cubed the size of the original location, and the selection is more like to the 10th… 11th power? Why are algebraic expressions so hard? Anyways, the point is they make some extraordinary sandwiches like this cold combination of house-made roast beef and mortadella, Fra' Mani salami, soppressata, provolone, Mama Lil’s peppers, red bell pepper, cucumber, arugula, and dijonnaise… all on a ciabatta roll. The couple behind this food truck are fusing together the Filipino and Vietnamese food they grew up with, adding in some Spanish touches, and serving the results from a classic taco truck. This includes their signature bánh mì, which comes with one of a handful of meats and all the traditional toppings on a 12-inch French roll. 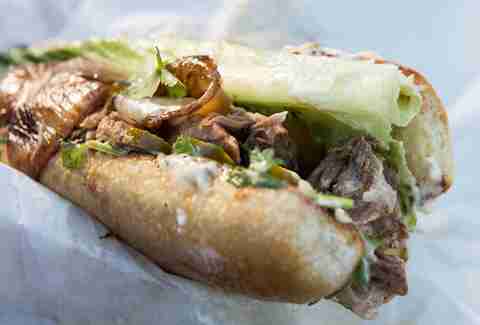 It may very well be one of the city's most underrated sandwiches. Bradley Foster is a former Thrillist editor who kind of regrets his decision to leave 'cause now he has to actually pay for things like $40 lobster rolls.